This year's contest is over and great memories remain. 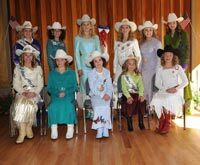 The 2011 Miss Days of the Old West royalty was announced July 4 before the standing-room-only third of three Days of the Old West rodeo performances at Hailey Rodeo Arena. The young women and their attendants played a big role in the Independence Day festivities and the 64rd annual Hailey rodeo. Gabrielle McMurphy, 13, of Ammon, a Teen Queen contestant, was the overall high-point winner. She received a saddle from the Sawtooth Rangers Riding Club. McMurphy also earned the title of Teen Queen. Besides McMurphy, the new royalty featured Katey Gutman, 16, of Salmon as Senior Queen; Zoie Pierce, 12, of Jerome as Junior Queen; and Micah McMurphy, 6 of Ammon as PeeWee Queen. Freestyle Horsemanship winner was Kaylaa Gutman, 14, of Salmon. She received a bronc halter from Kristy and Keely Lance. The Congeniality winner was BreAnna Olson, 15, of Salmon. She got two tubes of hand lotion from Isadora. Outgoing Days of the Old West royalty Jayd Wartluft, Katey Gutman, Hunter Rasmussen and Bailey Cole received flowers from these sponsors: Airport Cab/Sun Valley Limo, Clear Com Communications, Nelson's Auto Service and Quick Lube, and Deane Johnson. Contest organizer Michelle Bobbitt thanked T's and Temptations for the t-shirts donated to the reigning queens and contestants. She expressed her appreciation to Smoky Mountain Pizzeria Grill for the Frisbees thrown out during the rodeo. Vivian Bobbitt, Mary Ann Knight, Thelma and Lizzy Cameron, Sandra Bobbitt, Atkinsons' Floral Department, Bill Bozzuto, KECH/KSKI, Plum TV, Shoe & Tack Shop in Jerome, Shelly with Sawtooth Tack & Feed, Angie Cameron, Krystal Lee, Debbie Lee, Janell Jackson, Jan Jorgensen, Cami Pratt and all of the parents. Poise and Personality: Katey Gutman (Senior Queen contestant, hair products from Cari's Hair Care); Gabrielle McMurphy (Teen Queen, hair products from Growing Concern Hair Design); Emma Flolo (Junior Queen, hair products from Annie Jones-Cardona); and Micah McMurphy (PeeWee Queen, bath and lotion products from Color Tyme). Queen, picture frame from Mountain Paints); and Micah McMurphy (PeeWee Queen, picture frame from Judy's Design House). Speech: Winners were Katey Gutman (Senior Queen), Gabrielle McMurphy (Teen Queen), Emma Flolo (Junior Queen) and Micah McMurphy (PeeWee Queen). They received stationery and pens from Bigwood Body and Paint, Woodside Motor Sports, Farmers Insurance/Kendall Kinghorn and Giddy-Up Coffee & Kitchen. Horsemanship: Saddle blankets went to these winners—Lainey Owen (Senior Queen, from XTreme Note Finders/Anthony Dudley and C&R Electric), BreAnna Olson (Teen Queen, from Wall to Wall Const. and Farm Bureau/Norm Funk), Zoie Pierce (Junior Queen, from Wood River Boot & Saddle and Farm Bureau/Stephan Funk) and Micah McMurphy (PeeWee Queen, from J. Neel & Co. CPA and Wind Mills American Motorcycle). New Senior Queen Katey Gutman received a dozen roses from the Idaho Mountain Express; belt buckle from Westerra Real Estate and Edward Jones Investments; silver bracelet from POWER Engineers; sashe from Momentum Real Estate; horse sheet blanket from Vonnie and Hunter Rasmussen; flashlight/$25 gift certificate from Platt Electrical; thermos from Electrical Wholesale; gift certificate and blanket from Donnelley Sports; $25 gift certificate from Addison West Restaurant; and gift certificate from Jamba Juice. The first runner-up was Lainey Owen, 17, of Rupert. She received mother of pearl earrings from Lazy H Spear Appaloosa; $50 gift certificate from Radio Shack; flashlight/$25 gift certificate from Platt Electrical; gift certificate for facial at Trinh's Salon; and $10 gift certificate from Zulu Bagel. New Teen Queen Gabrielle McMurphy earned a dozen roses from Dusty's Electric; belt buckle from Valley Auto Body and Integration & Control Services; silver bracelet from Low Book Auto Sales; sashe from Advanced Towing & Recovery; $25 gift certificates from The Drug Store and South Valley Pizzeria; horse sheet blanket from Vonnie and Hunter Rasmussen; mother of pearl earrings from Lazy H Spear Appaloosas; thermos from Electrical Wholesale; $10 gift certificate from Zulu Bagel. First runner-up was BreAnna Olson. She won a pair of boot earrings from Christopher & Co.; $25 gift certificate from Full Moon Steak House; flashlight/$25 gift certificate from Platt Electrical; gift certificate for a haircut at Tula's Salon; and gift certificate at Mahoney's Bar & Grill. Second runner-up was Kaylaa Gutman. She won mother of pearl earrings from Lazy H Spear Appaloosas, flashlight and $25 gift certificate from Platt Electrical; 20-gallon crabapple tree from Clearwater Nursery; and earrings from Progressive Auto. New Junior Queen Zoie Pierce received a dozen roses from Wood River Welding; belt buckle from St. Luke's WRMC; silver bracelet from Branching Out; sashe from OK Auto Systems in Twin Falls; horse sheet blanket from Vonnie and Hunter Rasmussen; $25 gift certificate from The Drug Store; tack bag from D&B Supply; thermos from Electrical Wholesale; supplement from Herbs of the World; and gift certificate from Jamba Juice. First runner-up was Emma Flolo, 10, of Hailey. She won a $20 gift certificate from Rocky Mountain Chocolate Factory; necklace and earrings set from Sun Valley Garden Center; 10 DVD rentals from F-Stop Camera & Video; 24-hour bike rental from Formula Sports; and gift certificate from Gertie's Brick Oven. Brooke Rey ATC; horse sheet blanket from Vonnie and Hunter Rasmussen; $25 gift certificate from The Drug Store; mother of pearl earrings from Lazy H Spear Appaloosas; thermos from Electrical Wholesale; gift certificate from Jamba Juice; and grooming bag with supplies from Sawtooth Tack and Feed.